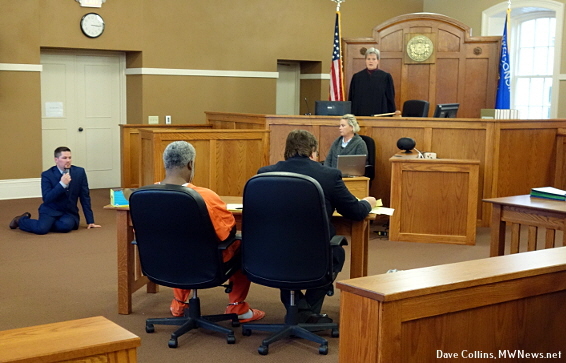 Prairie du Chien, WI - Oct. 10, 2016 - In a nearly empty Crawford County Courtroom of Judge Rider the defendant Jimmy D. McDaniel appeared on closed circuit TV with his public defender. The victim’s family sat behind prosecutor Tim Baxter. Bond was discussed. 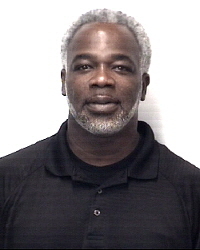 Due to the fact that the defendant is an over the road trucker who resides in Hampton, Ga., has little ties to this area, and the serious nature of the crime, Judge Rider set the bond at $500,000 cash. McDaniel is to have no contact with the Muns(sp?) or Little families. The next court date is set for Oct. 17th at 1:30 p.m.
On October 5, 2016, at approximately 12:15 a.m., a 911 call came into the Crawford County, WI Law Enforcement Center that a woman had hanged herself. Crawford County Sheriffs Department Deputies Kyle Mezera and Sergeant Phil Baumgartner, and City of Prairie du Chien Police officer Tony Berg, responded. Crawford County Sheriff’s department dispatch received a 911 call from a residence on Velvet Lane in Bridgeport Township. Officers responded and found Linda L. Kline age 53 of Velvet lane, Bridgeport Township, deceased lying on the ground outside the residence. Linda’s sister Michelle Little age 55 and Linda’s boyfriend Jimmy D McDaniel age 48 were also at the residence. The body was taken to UW Madison Hospital where an autopsy was performed. During the autopsy Forensic Pathologist Dr. Michael Steier ruled the death as a homicide. On October 6th 2016 the Crawford County Sheriff’s Department requested assistance from the Prairie du Chien Police Department to arrest McDaniel while he was in the lobby of one of the local hotels in Prairie du Chien. McDaniel was waiting for a ride to the La Crosse Airport to fly back to Georgia. McDaniel is currently in the Crawford County Jail awaiting a bond hearing on Charges. Crawford County Sheriff Dept. is continuing to investigate this homicide. 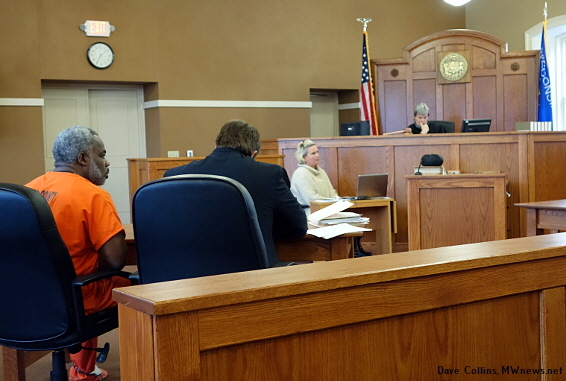 Murder defendant McDaniel makes eye contact with victim's family. 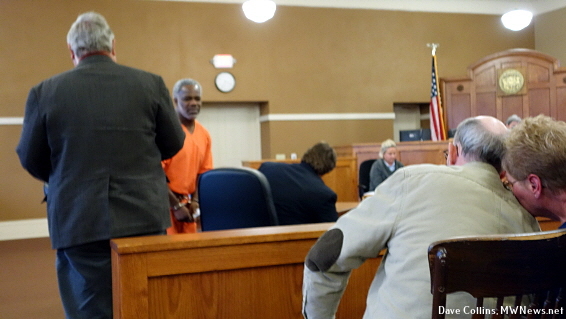 Jimmy D. McDaniel, age 48, was brought into the courtroom wearing an orange jumpsuit and shackles. As he made his way to the defense table, he turned to a woman in the gallery, who I believe to be the deceased's Mother, and with an agonizing expression on his face, mouthed something. Jimmy D. McDaniel, age 48. It was over in a flash, and as he sat down he turn away never looking towards the family again until he left the courtroom. He broke down crying uncontrollably at times as he sat at the defense table with his public defender Jeff Erickson. The victim's Mother was in tears throughout the proceeding. McDaniel made notes on a yellow pad in his lap as Crawford County Sheriff Deputy Kyle Mezera described the timeline. How the defendant provided a great many details leading up until 8:30 to 8:45 p.m., but could not provide any detail after that up to the time the 911 call was placed around 12:15 a.m. Deputy Mezera described how the defendant became very emotional after he was told that the victim, Linda L. Kline age 53, was dead. He yelled, “How could she do this. I loved her.” Deputy Mezera said in his opinion the reaction was exaggerated. The 16 or so people in the courtroom were family and friends of the victim. Lieutenant Jaden McCullick of the Crawford County Sheriff Office described the wooden cross-frame that the victim allegedly hung herself from according to defendant McDaniel. Lt. McCullick stated that when the crossbeam was casually pulled on, it fell apart. Ryan Fradette, the first Lieutenant Investigator to arrive on scene, stated that two autopsies were performed. He was present for the 2nd autopsy, and stated that the pathologist described the cause of death as blunt force trauma to the head and face, with defensive marks on the arms and hands. On the neck, there were discolorations like finger marks. The pathologist stated it was a “Staged hanging”. Lt. Fradette then demonstrated, by getting on the floor of the courtroom, how the body was found, and how the knot was tied under the victim's chin. At this point the defendant was crying again both during and after the demonstration, as was the victim's Mother. The judge ruled that there was enough evidence to conclude that a crime was probably committed given the 3 ½ hours that is unaccounted for by the defendant, and the case should be held over for trial. The date for the arraignment was set for November 21 at 2 p.m. (Reminder - Mr. McDaniel is presumed innocent until convicted in a trial) See story background: Bond set in murder case. Lt. Ryan Fradette (on floor, background) demonstrated how the body was found and how a knot of the wire was tied under the victim's chin. Crawford County, WI – December 8, 2016 – Judge Lynn Rider heard arguments on a motion to move the trial of Jimmy D. McDaniel, in the Linda L. Kline murder case, to another county due to the possibility that unfavorable publicity would prevent a fair trial. Public Defender Jeff Erickson quoted other case law for a change of venue, 'if there was a reasonable likelihood that a fair trial could not be had.' He further argued that the publicity, both in area newspapers and on Internet news sites, was inflammatory to his client. Judge Rider asked, 'wouldn't other parts of SW Wisconsin also see the same information? Erickson replied that perhaps, but it wouldn't get as much attention in Madison or Milwaukee due to their higher crime rates. District Attorney Tim Baxter pointed out that this publicity was in October. He stated that prejudicial pretrial publicity does not occur when the facts are presented. That the cases quoted by the Public Defender were 40 years old, and the Internet media has been around for.....pick a number [of years]. He further stated that reporting fact doesn't make it inflammatory. Judge Lynn Rider ruled that she did not find that pretrial publicity would prevent a fair trial, and denied the motion for a change of venue. Judge Rider did indicate that very careful jury selection would be in order, and that a large jury pool could be brought in to choose from, if needed. The Judge left the door open to refile the change of venue motion if conditions changed. 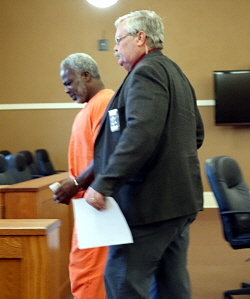 A jury status hearing, at which time a decision is made on whether a jury trial is scheduled, or if a plea arrangement is made, is scheduled for February 8, 2017 at 9 a.m.
Update - Jimmy D. McDaniel was found guilty of First Degree Reckless Homicide and Strangulation and Suffocation and will be held in the Crawford County Jail until sentencing on January 5, 2018.